I made the move to Yorkshire and specifically Horsforth towards the end of July 2017. I had not been particularly enjoying the lifestyle of my previous job and a vacancy was advertised at William Hill online in Leeds where I had previously been offered a job a couple of years earlier. I decided for once to throw caution to the wind and try something new and move to a new place with new people and a new job and just see how things went. So, I made the move from a small village in Bedfordshire called Clophill (notorious allegedly for its haunted and satanic church – see google and YouTube if that sort of thing interests you…can’t say I’ve ever believed it myself growing up there but each to their own). 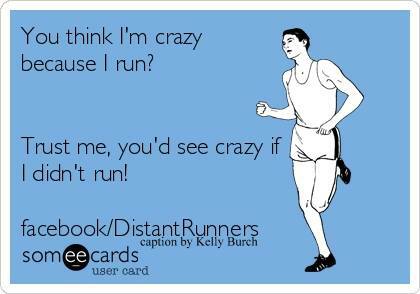 I first took up running in January 2012, in fact I got a book for Christmas in 2011 called “Running for Dummies” and as silly as it may sound that book was my catalyst to start up. After starting off very slowly, literally, and mainly running on a treadmill at my local gym, I began to get an appetite for the sport and entered my first 10k in April 2012 at a local town back home called Flitwick. 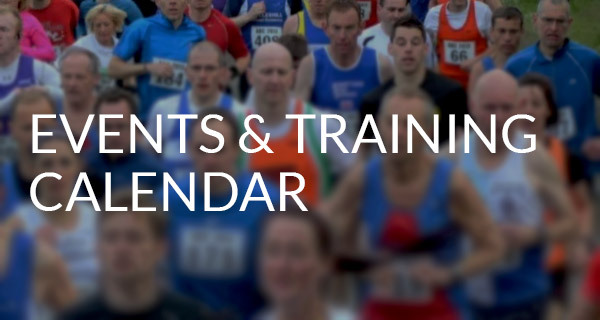 In the next three years I ran a fair few 10k races, a yearly 12k race and completed a couple of half-marathons in Bedford run by the Bedford Harriers club where Paula Radcliffe did her training. 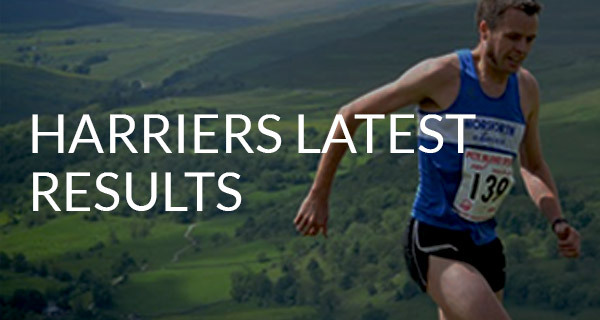 I was remarkably average, running my 10k in just under an hour and just over the 2-hour mark for my half-marathons, but as most runners will agree times really aren’t the most important thing. During these years though I was always an ‘independent runner’. On every entry I had to list myself as club: unaffiliated, pay the two quid extra and ultimately turn up on my own, hang around on my own, and go home on my own. It was difficult to join a club and go with any regularity as my hours were very sporadic at work and the night I did request off each week in the winter months was to play for my snooker team in the league I had been playing in for years. I decided that when I moved up to Yorkshire it would be the perfect time to join a running club. It would give me a regular hobby, help me meet new local people and share my enthusiasm for something with other like-minded people in my new home. 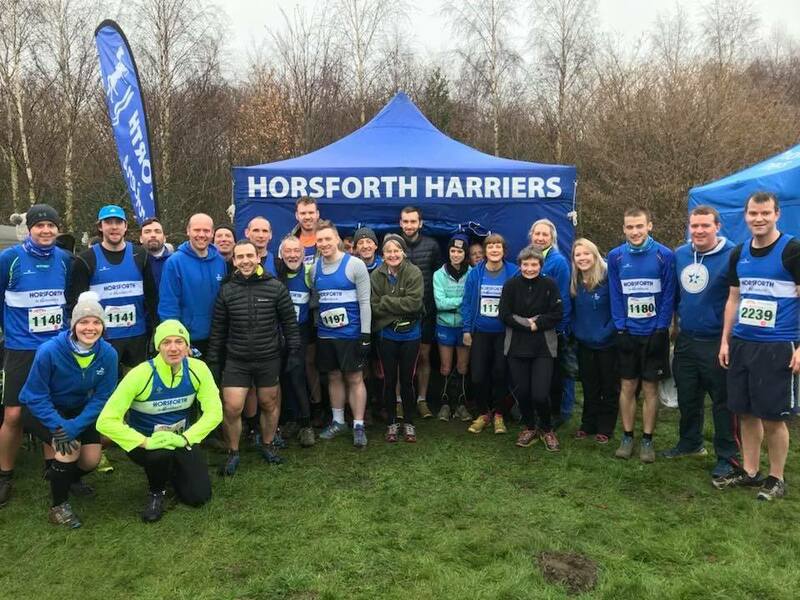 I did plenty of research on local clubs and settled on the Horsforth Harriers mainly on their promise of being one of the friendliest clubs in West Yorkshire. Cynically I thought, well they would say that – so it was time to see if it was true. I sent a couple of emails to find out more and was invited to join in at one of the Tuesday night sessions where I would be put in a group with people of a similar ability and go from there. 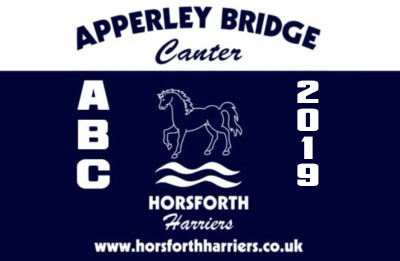 And so, after some nervous asking around on my first night I was told to join Helen’s group for a 6 mile run in the Yorkshire countryside over to the canal at Rodley on a summer’s night in early August. I was made very welcome and was very fortunate to bump into two friendly gents Pete Scanlon and Mike Mooney. 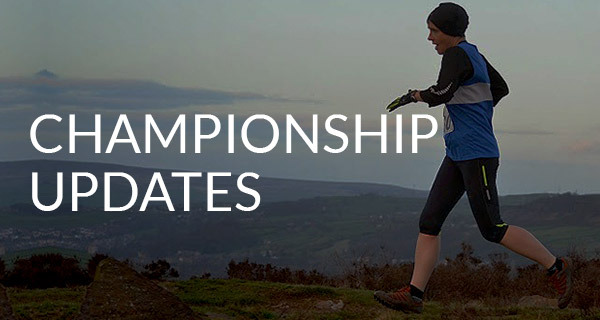 As most reading this will know, Pete is a larger than life character from the other side of the Pennines whom by his own admission running has been a big help to him in recent years. He told me about this and his passion for his beloved Burnley on the way round. His knowledge of the James Hanratty A6 Murders and the hanging of Derek Bentley both with close links to where I lived were particularly impressive! I had an equally interesting chat with Mike and finished the night having a pint with him, after he kindly bought me one to round off my first night at the club. I knew from that evening onwards that it would definitely be the club for me and the sort of place I could get to know people, keep fit and have fun. And so I did. 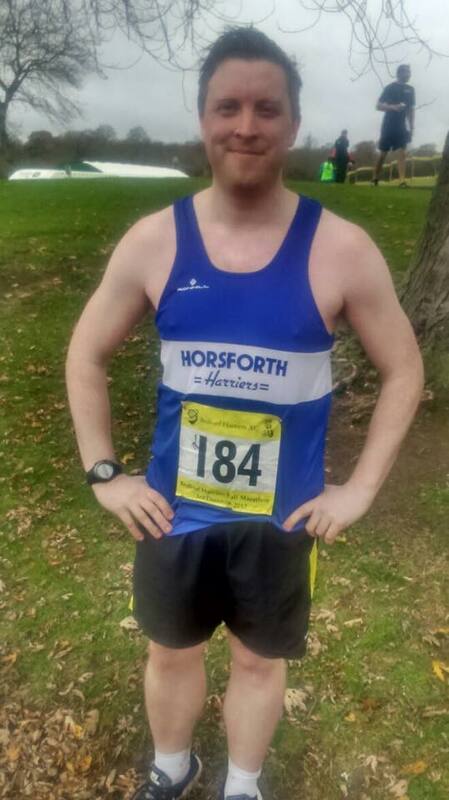 I ran several 10k races with the club at Bramley and The Abbey Dash Leeds amongst others. 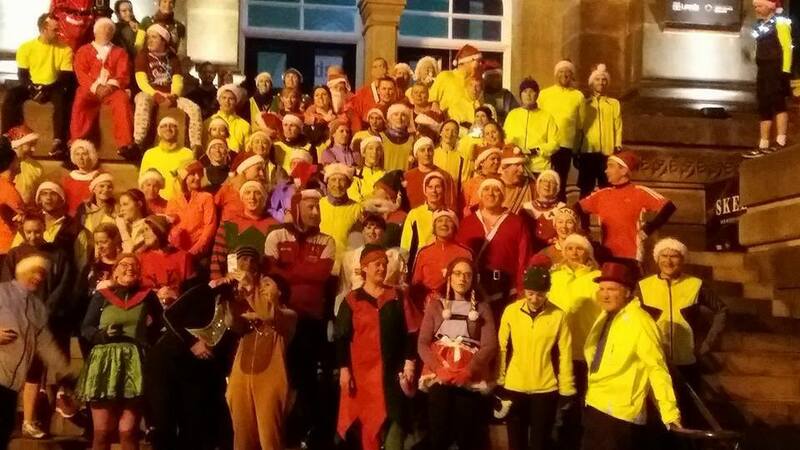 I took part and took cake (from Morrison’s) to the Harriers parkrun take over at Bramley Park, and even ran around the streets of Kirkstall and Leeds in my Santa’s elf outfit at the club’s annual Christmas lights run. I was enjoying it and I managed to top off the year running my first ever sub 2-hour half marathon back home in Bedford doing 1:57 and my 10k times were getting close to the 50 minute mark. I had a regular hobby where I was running three or four times a week. I was meeting lots of new people and I was swapping drinking beer every Saturday evening for getting my kit out for a Sunday morning run somewhere in Yorkshire. 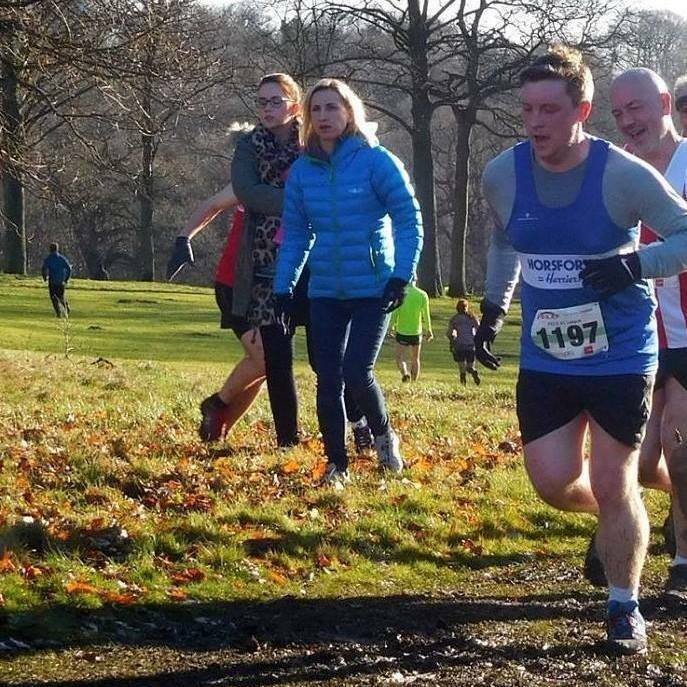 2018 started much the same, I took part in two of the PECO cross-country race runs at a freezing cold and snowy Middleton Park and then Roundhay. Extremely tough and tiring, and well out of my comfort zone, but an immense sense of achievement after completing them. In addition, I enjoyed the Thursday winter training sessions put on by Garth and Marie. Unlike a lot of other sports, you are never made to feel inferior at being of less ability than others. Marie’s enthusiasm is infectious and she will persuade you to do another sprint on a cold Thursday night in freezing cold temperatures, when all you want to do is go home. Thanks also to Kelly Squires for helping me find the spots to meet up in for those Thursday sessions too. If you haven’t tried them, or you are contemplating trying them, definitely give them a go. Unfortunately, this is where the story takes a turn for the worse. Towards the end of January and early February I began to feel discomfort during my runs. Not yelping pain, but enough to spoil any pleasure I was trying to derive. Knowing things were not getting any better I tried several physiotherapists, spending probably £300 in the process all in all! Eventually after no improvement, it was time to go to the GP. After a long wait for an ultrasound scan, I was told I had an inguilar hernia in my right abdomen/groin and would require surgery. It was nice to finally know what was wrong but sad to know how long things would take. As I type this now, I am still on the waiting list for surgery and expect to have my operation towards the end of August or early September on the NHS, some 6-7 months after first experiencing the pain. It is important to keep things in context. I have a hernia, a little alien type thing poking out of my side and in the grand scheme of things when people are fighting life threatening illnesses or are confined to wheelchairs I have absolutely nothing to complain about. But, as many people I’m sure will understand themselves (as much as it may sound like a cliché), running and exercise in general, is as much, if not more beneficial for the mind than anything else. I have found this to be so true over the years, at least from my personal experience. Running won’t solve your problems as such, but it can make you view things from a different perspective and a much more positive angle. As they say, the hardest thing sometimes is getting out of the door – and it’s true. But after that you will be surprised what it can do. The release of serotonin and dopamine, the same chemicals that are generated with most anti-depressants, gives runners that post-run feeling of positivity and optimism. I have definitely noticed the difference since my time out. I’ve felt less fulfilled, more prone to worry, anxiety and obsessive thinking. I feel less sharp and I’m sure it is no coincidence. I can still do a little bit of exercise at the gym (no lifting of any type, just some gentle cardio) but it’s not nearly as fun and I’m not very motivated to go there. I’m drinking more beer and eating more rubbish, though that is something I can address. But as much as that, I’m missing being part of the club, especially when I moved to a brand new place and it had become such a good thing to be involved with. I volunteered for marshalling duties at the ABC race and went to the Harriers Quiz night (we came 2nd and I had even more Maltesers to binge on as a prize! ), so I have tried to keep involved, but my feeling at the moment is that my main hobby and tool for physical and mental well-being has been taken away from me.